Na obrazku widzę... In the picture I can see..
Ma na sobie... She is wearing…. Wygląda na szczęśliwą. She looks happy. Wygląda jakby się dobrze bawiła. It looks as if she's having a great time. Być może jest na wakacjach. She may be on holiday. Wydaje się być podekscytowany. He seems excited. / He seems to be excited. Wydaje się, że się dobrze bawi. He seems to be having a good time. Oni mogą być razem They could be together. Prawdopodobnie są przyjaciółmi. They’re probably close friends. Wydaje się, że świetnie się bawią. They seem as if they are having a great time. 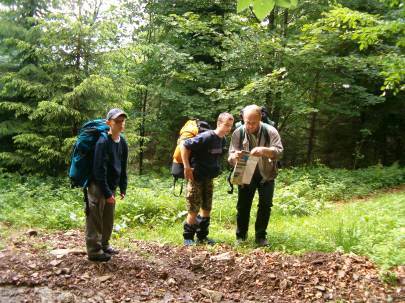 The picture shows a group of people on a trip in a forest. I can see two teenagers and an adult; he might be their father or a teacher. It is probably a walking tour as they are wearing boots and carrying rucksacks. They may be on holiday or on a school trip so it is probably spring or summer. Two of them are looking at a map, trying to find or check the route. They seem to be excited and it looks as if they are having a great time. However, the boy on the left appears to be tired or a little bored. I think he would like to have a rest. In the picture I can see some people in the street. I think it could be Chinatown in London or maybe some other city. In the bottom left-hand corner two people are talking. The woman is smiling; she seems to be interested and delighted. They are probably friends. In the background, in the middle of the picture, there is a Chinese gate. Some people are walking under it and looking around. I believe they might be tourists and they seem as if they are having a great time. In the picture I can see two people spending some time together. They are sitting on a wooden bench at a table. It may be in a forest or in a garden. They are playing a game of chess. The boy is holding his hand close to his forehead so he seems to be thinking intensively. 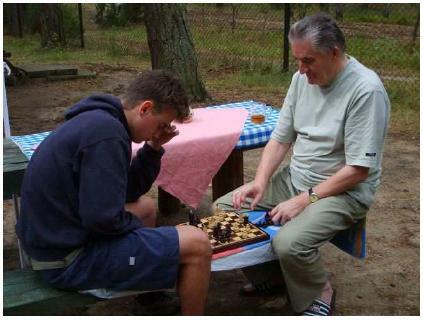 The old man is going to make the next move, and he appears to be concentrated on the game, too. They could be a grandson and a grandfather. The boy is wearing shorts and the man is wearing a T-shirt so it’s probably summer. I guess they may be on holiday together and they seem to be having a good time. Świetna sprawa, może umieścicie te materiały na http://maturzaki.pl ? Więcej ludzi do nich dotrze.